Brandon “Bam” Margera, a skateboarder, actor, rapper and tv and radio entertainer, lives in a gothic-style mansion in his hometown of West Chester, Pennsylvania. Bam’s net worth is estimated at $45 million at the end of 2014. Most of his money has been earned through his association with the “Jackass” television shows and several related moves, and his television show “Viva La Bam” and spinoff shows such as “Bam’s Unholy Union”. Bam also earns an annual stipend of an estimated $2 million for wearing Element brand attire. His total annual income is estimated at $6.5 million. The house was listed for $1.19 million when it was sold to Bam in 2002, though the agreed selling price was never made public. The mansion was built in 1985, has five bedrooms and three and a half baths, and sits on nearly 14 acres. In addition to the main house, it has a pool, barn and detached garage. Bam constructed a skate park and BMX bike track on the property. Bam’s mansion, nicknamed “Castle Bam” became famous in its own right as it was featured on Bam’s television show “Viva La Bam”. Castle Bam was featured on MTV’s show “Cribs” in 2008. In the episode, Bam showed off his antique juke box, gothic style of decorating, and pirate themed bar. His detached garage holds a Mercedes, Lamborghini, Hummer and other high-end vehicles. Bam maintains close relationships with both his family and hometown. Bam’s parents, Phil and April Margera, who were often featured, and pranked, on “Viva La Bam” continue to reside in the mansion, and a relative lives in another house on the property. Other family and friends often stayed with Bam or resided in the house throughout the filming of the television show. Bam originally became famous through a series of skateboarding stunt videos released in the late 1990s and early 2000s as part of the CKY Crew. These videos eventually drew the attention of Johnny Knoxville and Jeff Tremaine, who created the MTV hit show “Jackass”. Bam’s personal life has often been public, with girlfriends and wives appearing in his television shows and either participating in or being mentioned on his radio program. Bam’s relationships have often been tumultuous. He lived with fiancé Jenn Rivell throughout several episodes of “Viva La Bam”. After the relationship ended he filed for an order of protection against her after she broke into Castle Bam. He went on to marry Melissa "Missy" Rothstein. The engagement and ceremony were turned into the television series “Bam’s Unholy Union” in 2007. The two separated in 2010 and were officially divorced in 2012. Bam then married Nicole Boyd in Finland. Nope, sorry. That's not it. Close, but you can tell from two things. The driveway in the show is surrounded on both sides by lots of trees, not a few. Also, the pool is the shape of a rectangle. Take the credit; I don't care. Updated unless someone can confirm otherwise. And just to let you know, he lives in West Chester... Not Chadds Ford. Sorry for your luck, but next time, either don't take a false pic, or try to look for errors if you're just searching for an already taken pic of his house. Good try though. Actually, it's none of those. I saw it one time. I'm still lookin for it. It's like... West somethin St.
idiots, all of you. the barn is owned by MTV. they pay for him to stay there with his friends during the fimlimg of the show. Ape and Phil do not live there, they are still in their old house, the while one from Jackass and no I won't tell you where that one is also. the clues are close, the pics are close, but if you can't figure it out, you don't deserve to know. OK. Enough is enough. Publically posting of private address crosses the line. This thread has been bothering me for a while, but I couldn't justify to myself shutting it down. Now I can. After this point, any posts on the subject of Bam's address for any reason will be deleted. The exception to this is discussion of whether the linked map actually shows his house. There appears to be some question whether this is the case, and discussion of that topic is free to continue, as it is totally on topic for the site. But the discussions on the address itself are over. BACK ON TOPIC, my college roomate will be driving back from Rhode Island to our University, and he will make a stop at the house that I suggested is the real house and not the one in the thumbnail. It will be about a month, but he said he will take some pictures of the house in question to confirm that the houst taht I pointed out is in fact the real house. I'm the one that posted the address and i'm very sorry, i knew i shouldn't but i did for some reason anyway. But yes that is his real address and that picture is correct that seabass put up. I live and PA and I visited my friend who goes to west chester university a while back (which is very close to bams house). He found out b/c his uncle works for the post office in the area and came across the address at some point and told him. We drove there and took a quick look around and yeah its definatley his house. He even said that when he went with one of his friends before that he saw what appeared to be a camera crew, but he wasn't sure b/c he couldn't get that good of a look for obvious reasons. And he knows some of the places that where shown in the show like the wing place that don vito went took his date, and they are in the area. And yeah thats really his house he has more than enough money to buy that kind of house and its not rented by mtv. Houses like that in the middle of no where in PA cost less that a million $. He obviously gets paid well my mtv as its one of there more popular shows and plus his skateboarding money with merchandise and videogames and such banks him a lot of money. And the show itself is completly staged and paid for by mtv so bam and his friends live pretty comfortably for the time of taping. And then can go travel in the downtime. And his house cost like 1.6 million, i think.. i remember reading an Associated Press article in wich it said his house, wich was purchased by MTV, cost 1.something million dollars. and that picture at the top is NOT bam's house.. his pool is a rectangle. Is his house on the east or west side of Hickory Hill Rd? I'm looking on Google maps and I am not seeing a pool or the driveway. Isn't it the only house on the West side of Hickory Rd.? Ok. I've pruned out all the old comments about Bam's address as well as a number of other old, garbage comments. I left only the one comment from MrSeaBass stateing he might give out the address if emailed. People are still posting requests for the address every couple of days. Let me repeat. With the exception of discussion of whether the entry itself is correct, any comments on Bam's address, real or email, will be deleted as soon as I see them. This includes requests, offers, begging, whining, or posting of the address itself. I see them, they're gone. Period. Don't bother posting them any more. It also has another flaw in it. There is no treetop casino! The woods is a lot bigger too. how can you guys tell if it is really his house? i think thats his house, you can tell cause of the size of his actual house and the 'hobbit hole'. Also the pool is the same. The property seems as big as on the show as well. Plus, how many other houses look like bam's in westchester with the snakerun driveway and all, none. also, that satillite picture could of been taken before the tree top casino was put up. Google maps said that these pictures could of been taken within the last 3 years. O yeah, and if yuo wanna get a closer look and see it at more angles, download google earth, its pretty cool. this is NOT his house. his house has a snkerun driveway as u will see in 1 episode with compton @#% terry and even if the tree top casino was not there th trees would have. so whoever got this is wrong (not to be rude)but i am an expert. how do u not know that this is not his house. anyone who loves him like me should be able 2 tell its not his house. not true i in fact know raab himself bam lives in his "new house" don't even start to argue. These pictures are in many cases a few years old, and any recent improvements done in the last couple of years, such as a "snake run driveway" wouldn't show up. The base map images for the Philly area were taken in May 2002. Some of the pictures in the surounding areas were taken as early as 2000. So this was taken between 200 and 2002. Look, the map link above will take you to his house. I live closeby. I know it is his house. I drove past there yesterday. I saw his black Mercedes in the driveway. I saw the limo with the hood scoop on it, along with a bunch of ramps and crap all over the yard. It is his house. He has high fencing along the street, a "No trespassing" sign in the driveway, and tons of video cameras monitoring the property. Also, this house was purchased by Bam, not MTV. This is the house that he lives in. 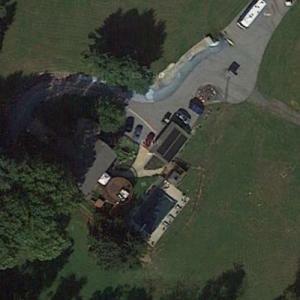 Brandon C. Margera bought this house on 8/8/04. If you search hard enough you can find the real estate transaction showing just that. Also, this is not in the middle of nowhere in PA. This property is in West Chester, PA. Many people who live in this area commute to Phila daily. Bam's neighborhood is a very expensive suburb of Philly....big houses....lots of property...you can't buy something under a million there. Hopefully this will put things to rest. Stop posting his address. If you really look hard enough you can find it. I would assume that Bam stays at the barn for mtv purposes only and has several different locations in which he stays.Just look at all the cars he has the guy is loaded and just like many superstars he probably cant be tied down to one location.However I did see mtv cribs and was filmed at a location in westchester! Nope Bam lives there year round and it is his only house. I went their this summer and it is on hickory hill road. There are about six cameras on the top of his fence. There is a gate but it was opened. There are only about 7-8 houses on hickory hill road so it is easy to find. He lives on the west end of the road. His house is the very last and it is easy to spot because of the 1/8 mile 8 foot high wooden fence with cameras. Thank you so much for being so nice and giving an idea of where he lives and what looks like.I've been looking for it for a long time and i never could find it.I'm so happy.thank you so much again. Comments have been closed off for this map. The discussion of whether this is or is not Bam's house has been going in circles for some time, getting nowhere. Between that and the fact that we still get people asking/begging for his address, comments on this map no longer really serve a useful purpose to the site. I'll leave the existing comments up, so people can see for themselves the arguments people have made to date in the "is it/isn't it his house" argument, but the entry is now closed to new comments.